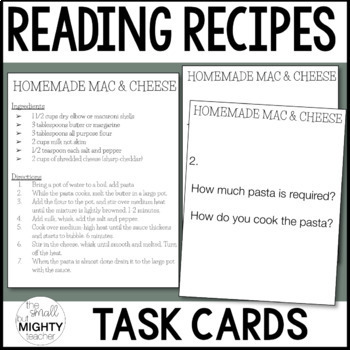 This printable has 32 tasks cards where students are asked to look at a recipe card and answer specific questions about the recipe. This is great for practicing for a cooking lesson, or functional reading skills. These print 4 to a page (even the recipes). Just PRINT AND GO! Laminate and use over and over!